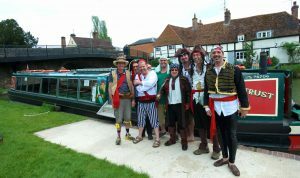 The Rose of Hungerford is available for hire, and there are a number of different charters with different time durations. 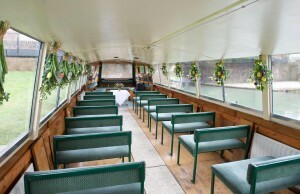 Or why not charter just for your special occasion? Family parties, children’s parties, club, work, school, association and support group outings, weddings etc. We can take up to a maximum of 50 passengers and with our electric wheelchair lift, so no one should be left out. From Hungerford Wharf, passing under some classic canal bridges, we go east, tracking the River Dun with its multiplicity of fish farms, and on the edge of the lovely Hungerford Port Down. Beside the first lock, Dun Mill, is one of the famous fortified “Pill Boxes”, built as part of a defence line along the canal at the start of World War II, and manned by the Home Guard. Beyond the lock, the Dun flows into the beautiful chalk-stream River Kennet in the valley below. Just after this we turn the boat to return to the Wharf. From Hungerford Wharf, passing under some classic canal bridges, we go east, tracking the River Dun with its multiplicity of fish farms, and on the edge of the lovely Hungerford Port Down. Beside the first lock, Dun Mill, is one of the famous fortified “Pill Boxes”, built as part of a defence line along the canal at the start of World War II, and manned by the Home Guard. Beyond the lock, the Dun flows into the beautiful chalk-stream River Kennet in the valley below. Following the river valley, we then pass through Wire Lock. Here – depending on the conditions – passengers can disembark briefly to stretch their legs and enjoy the views of the beautiful Berkshire countryside. They may also, under the supervision of our crew, assist in opening the gates and working the lock paddles! 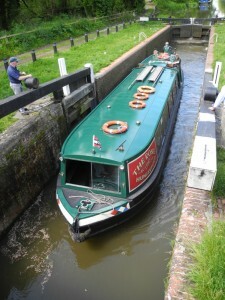 Meanwhile, we turn the boat below the lock, before picking everyone up again for the return trip to the Wharf. From Hungerford Wharf, passing under some classic canal bridges, we go east, tracking the River Dun with its multiplicity of fish farms, and on the edge of the lovely Hungerford Port Down. Beside the first lock, Dun Mill, is one of the famous fortified “Pill Boxes”, built as part of a defence line along the canal at the start of World War II, and manned by the Home Guard. After passing through the lock, we cruise along the valley, following the beautiful chalk-stream River Kennet, which has just joined the Dun. We then pass through Wire and Brunsden locks and arrive at the pretty village of Kintbury, where we turn the boat and start our journey back to Hungerford Wharf. Depending on the conditions, passengers may disembark briefly to stretch their legs by walking between locks, enjoying the views of the magnificent Berkshire countryside. They may also, under the supervision of our crew, assist in opening the gates and working the lock paddles! From Hungerford Wharf, we go west, immediately passing through Hungerford Lock, travelling close to the beautiful St Lawrence Church, through a manual swing bridge and onto Freeman’s Marsh. The Marsh covers 90 acres of wildlife habitat that straddles both the Rivers Dun and Kennet, and the Canal. Here we find the unusual Hungerford Marsh Lock, with a swing bridge across it, and then travel on to Cobbler’s Lock, with its classic lock keeper’s cottage. Crossing over the River Dun, we proceed through Picketfield Lock, bringing us to the edge of the wonderful Savernake Forest. Turning soon after that, we slowly return to Hungerford, with some of the most spectacular views of the town, especially in early evening. Depending on the conditions, passengers can disembark briefly to stretch their legs by walking between locks, enjoying the views of the magnificent countryside. They may also, under the supervision of our crew, assist in opening the gates and working the lock paddles! ▪ A fully licensed bar – please note the bar can only take cash, we have no card facilities on board.